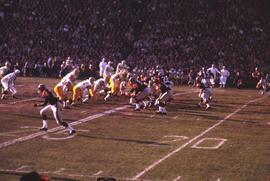 Colour Kodachrome 35mm slide depicts the BC Lions playing the Hamilton Tiger Cats in the Grey Cup, which was held in Toronto, Ontario, Canada. 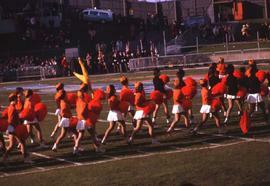 Colour Kodachrome 35mm slide depicts the BC Lions' cheerleaders walking across a football field wearing orange sweater, white skirts and black and orange hats, while holding orange pompoms. Oral history interview with Bobbie Ogletree.